Holy Cow that is gorgeous!! How big is it?? Yes, I agree, this is exactly the sort of quilt that would look fantastic with those perle threads and informal sashiko stitching. Love the colours you’ve used. I’m talking about the Which way? quilt not this one.Is that what you meant? 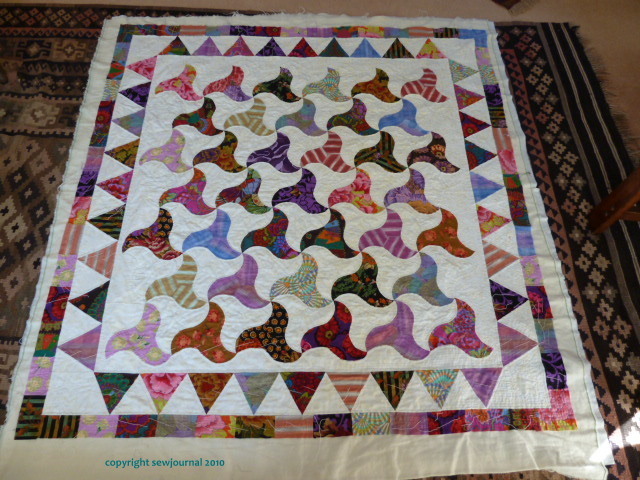 This one has already been quilted by hand. What a beautiful quilt. A bias stripy binding would finish it of spectacularly. As for machine vs hand quilting, I strictly use my machine for everything – even sewing on buttons. But, fear not! If you’re doing an allover design, you can put the thicker threads in your bobbin and quilt it upside down so the thicker thread ends up on the top!